"You have an important life purpose involving communication and the arts. Please don't allow insecurities to hold you back. I will help you." I am with you as one of your guardian angels. 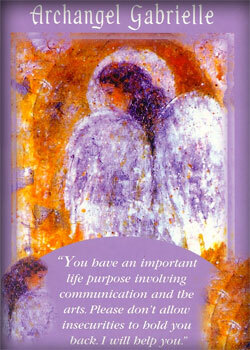 You may wonder why an archangel is with you. I help many people simultaneously, and you are among them. I help those whose life purpose is in the arts or communication. I will help you polish and trust in your natural talents. Then I will open doors for you to express those talents in a way that will help others. What I need from you in return is honesty and cooperation. Tell me about your fears, your hopes, your confusion, your insecurities, and your dreams. Ask me to help you. And then, please walk through the doors of opportunity that I open for you. I am on your side completely! My function is to be your coach, and as such, I may prod along you. Please know that I am only pushing you because I know that you need a little boost from above.